Jessie Gray by Robert Brough and John Bridgeman. THE NEW DRAMA OF "JESSIE GRAY," AT THE ADELPHI. 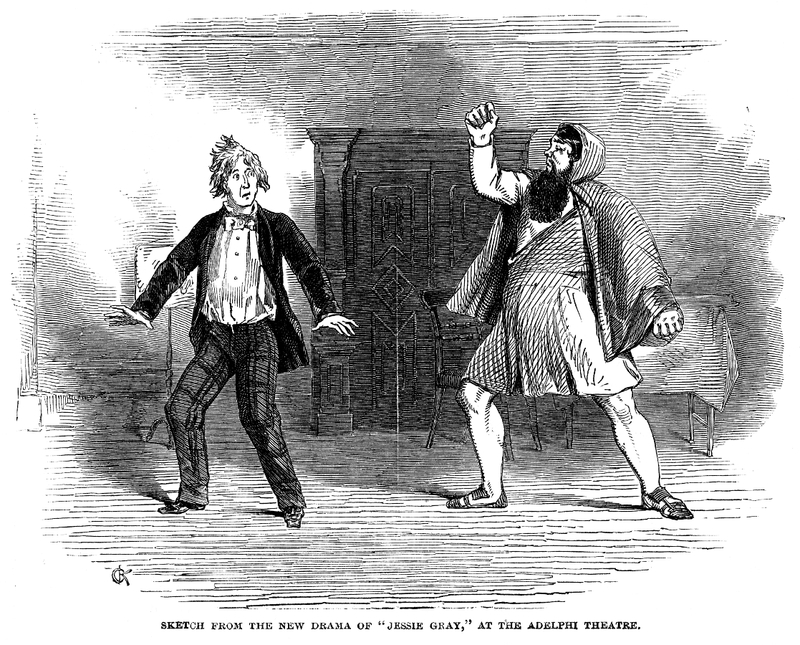 A piece, consisting of superior elements, and well constructed, the joint production of Mr. Robert Brough and Mr. Bridgman [sic], was produced on Monday. The materials are for the most part familiar to the dramatic student. Jessie Gray, who gives name to the piece (Madame Celeste), is the supposed daughter of an apothecary, who rejoices in the complimentary title of Dr. Gray (Mr. O'Smith), and who becomes beloved by the nephew of a haughty baronet. The former (Mr. Boyce) courts her in the disguise of an artist; the latter (Mr. Hughes), to wean the boy from Jessie, contrives a plot for the ruin of her fame, which is effected after the pattern of Don John and Hero, in "Much Ado About Nothing." The Baronet succeeds in his object; but, to "make assurance doubly sure," resolves on removing the humble object of his love out of reach. Just at this juncture, however, he discovers that Jessie is none other than his own child, and is then, consequently, as eager to unite the lovers as he was previously to separate them. There is, of course, a comic underplot, which consists of scenes between the apothecary's assistant (Mr. Honey) and his sweetheart (Miss Fitzwilliam) - the former a rascal with a conscience which renders him ridiculous. The part was acted with much grotesque humour, and, by his manner of acting it, justified himself in assuming a higher position than he has yet held. The success of the piece was decided; and the two authors had, as usual, to bow from the box to the gratulations of the audience.